1.6 Which green screen software for mac to choose? The Chroma Key effect is one of the most popular effects today, largely because it allows filmmakers to create dreamlike worlds that have never been seen before on the big screen. The rapid development of consumer-level video editing software has enabled non-professional video editors to use Chroma Key effect in their videos, which means that producing mind-blowing green screen effects no longer requires you to have enormous production budgets. 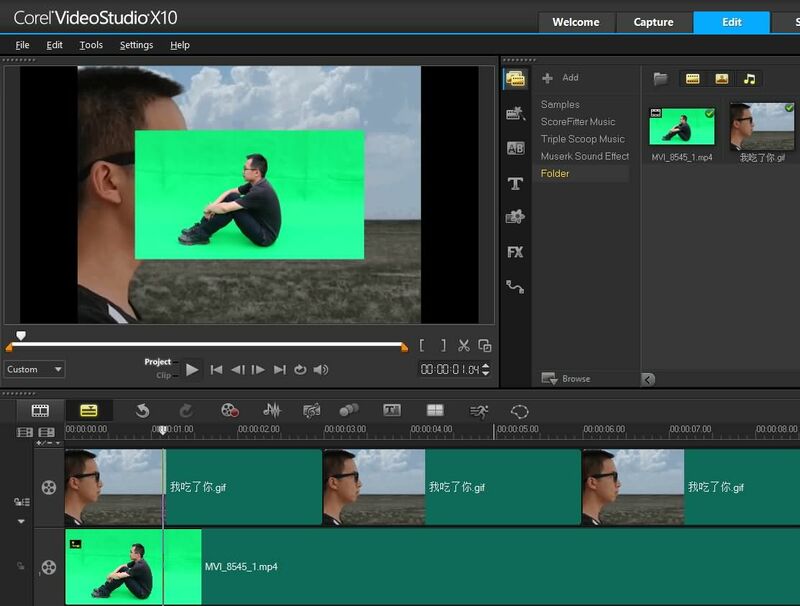 Corel VideoStudio Pro X10 features a Chroma Key effect and in this article, we will show you how to use this effect in your projects. Let's have a look at the steps you need to take if you would like to create a green screen video. The production of green screen videos requires you to have actual footage of actors or objects in front of a green or a blue screen. Creating green screen videos without such footage is impossible, therefore you must record all the video clips you will need in the post-production at first and then start the process of creating a green screen video. Downloading green screen footage from one of the stock footage websites is also a possibility if you don't have the means to record green screen footage. Green screen videos consist of two different video clips, a background video that contains the location to which you'd like to place objects or actors in your video and a green screen footage that contains the on-screen movement of objects or actors. Click on the 'Folder' icon to start browsing your hard-disc, and locate the video clips you want to import into the Corel VideoStudio Pro X10. Select the video clips and click 'OK'. You'll be able to see your clips in the editor's "Media Library', simply drag the background video to first video track on the timeline, and then place the green screen video clip onto the overlay track directly under it. Adjust the duration of the superimposed green screen video clip by dragging its ends and also make sure that the overlaying clip is placed at the exact position where you want the green screen effect to begin. Once you've positioned video clips in accordance with your demands, you can either click on the 'Effects' panel and then drop the 'Chroma Key' effect on the green screen clip to apply it or you can select the overlaying clip and click on the 'Open Options' panel. After the 'Attributes' window appears on the screen, click on the 'Mask & Chroma Key' feature. In the drop-down menu, you need to select the 'Chroma Key' option from under Apply Overlay Optioins. Applying the Chroma Key effect will remove a specific color like green or blue parts of the superimposed video. Click the eye drop tool to select the green color as the above screenshot shows and the background video will become visible. Proceed to fine-tune the 'Chroma Key' settings such as 'Similarity' and adjust the on-screen position of the superimposed elements by clicking on 'Alignment' and selecting one of the featured options. If you would like to change the size of the overlaying clip, simply drag the corners of the rectangle displayed on the preview screen until you find the perfect size. You can also adjust the Gamma settings to change the image contrast as well. Tinkering with 'Chroma Key' options may take some time because removing all traces of green background as well smoothening the object's borders requires precision. Afterwards, you'll need to save all the changes you've made, and in order to do so, you need to click on 'File' menu and then select 'Save' or 'Save as' option. Click on the 'Computer' icon to select the video file format and hit 'Start' to commence the rendering process. As great as Corel VideoStudio Pro X10 may be, applying 'Chroma Key' effect in this software is anything but a simple task. Aspiring video editors who would like to create green screen videos with ease should try using Wondershare Filmora video editing software. The Wondershare's software enables its users to create the green screen effect in just a few simple steps. If you would like to create a green screen video with Filmora, you need to double-click on the superimposed video clip, and then click on the 'Advanced' button once the Settings window appears on the screen. In the next step, you will have to click on the 'Effects' option and then select the 'Chroma Key' feature from the drop-down menu. Make sure to click on the 'Make parts of this video transparent' checkbox, select the color you'd like to remove and then just confirm the changes you've made. You can then adjust the shadows, border, flip or rotate the clip. Beside, you can choose one target mask shape from the Mask tab and adjust the compositing settings like blending mode and opacity. The process of creating green screen videos in Filmora is fast and simple and it doesn't require you to needlessly spend an extended period of time trying to adjust the setting perfectly like it does in Corel VideoStudio Pro X10.